If you follow me on social media you may have heard the exciting news: we bought a new house! We are just moving a mile away in the same neighborhood but with two growing boys and my growing home-based business, we simply needed a bit more space. My husband has been slowly but surely boxing up as much of our house as possible in preparation of the big move so I’ve been keeping dinners as easy as possible lately. 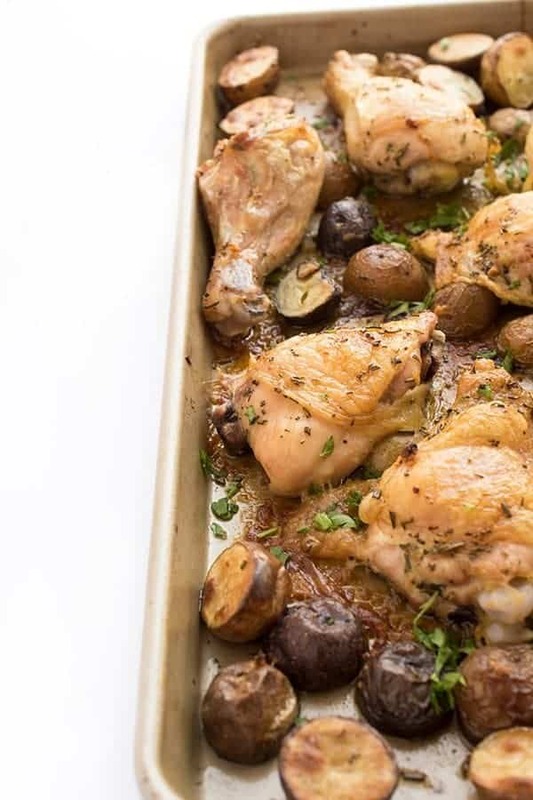 Most recently, we enjoyed this sheet pan dinner recipe made with chicken, potatoes, rosemary, garlic and lemon. We are a huge fan of the colorful Terrific Trio variety of The Little Potato Company but any variety works. If you don’t have drumsticks on hand, you could use chicken breasts or thighs. Easy, mess-free and always a family-favorite, we are a huge fan of sheet pan dinners these days. 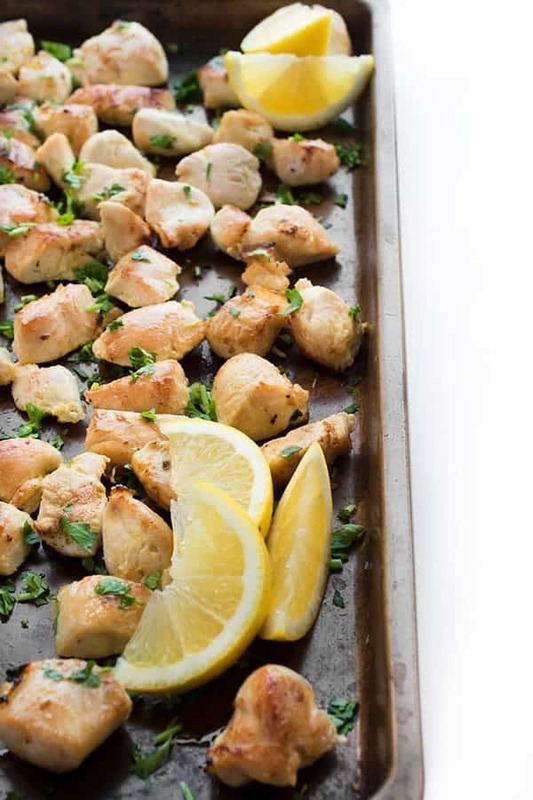 What are your favorite sheet pan recipes? I’d love to hear from you! Pre-heat oven to 400 degrees. 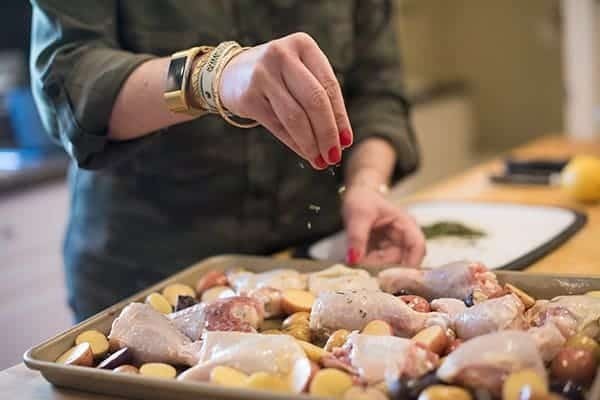 Lay chicken and potatoes in a single layer on a baking sheet and drizzle with olive oil, garlic, rosemary, salt, pepper and lemon juice/zest. Using your hands or tongs, toss everything together so that chicken and potatoes are evenly coated in spices. Roast until chicken reaches internal temperature of 165 degrees or higher, about 25-30 minutes. Check out my Pinterest board for more healthy and easy dinner ideas! looks delicious and easy to make. thanks for sharing. Simple ingredients always make the best dishes, right ? Thank you so much for sharing this with us ! This looks so flavorful!! I love how easy it is! Another awesome way to use my favorite little potatoes! I know the craziness that comes along with moving all too well, and cooking easy meals during that time is definitely a must. Ahhh yes I can’t wait to get to the other end of moving! Ahhh I wish you could come over! 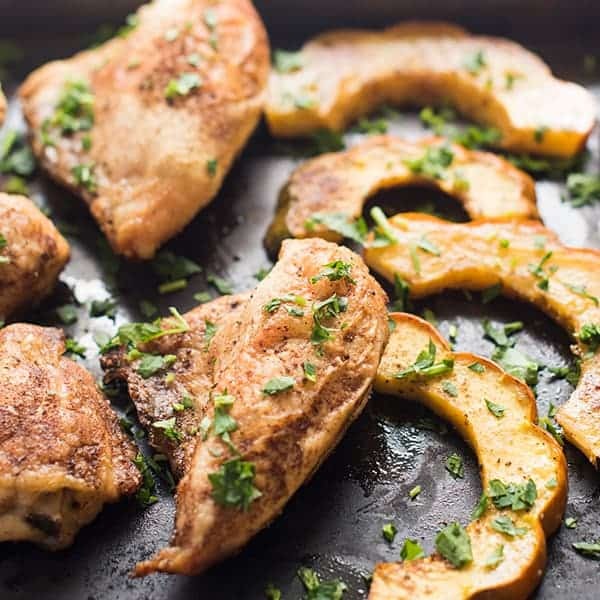 I love sheet pan dinners, they are so helpful and easy! I hope you love it Meg! 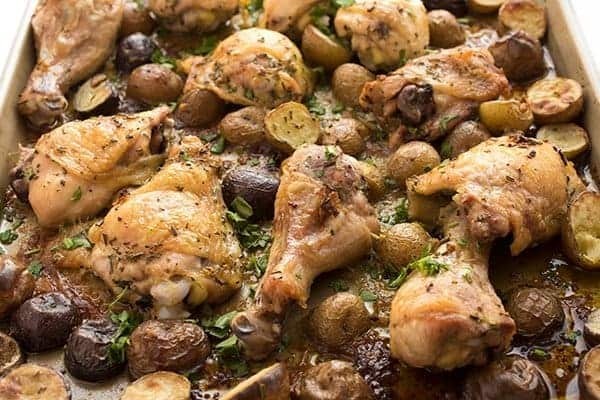 Amazing this dish, looks very delicious, gave even the will to spiri ..
A favorite trio of flavors (chicken, potatoes, rosemary) all on one pan. LOVE! Putting this on the menu this week! Sheet pan dinners give me life during busy weeks! Pinning this one for later!! 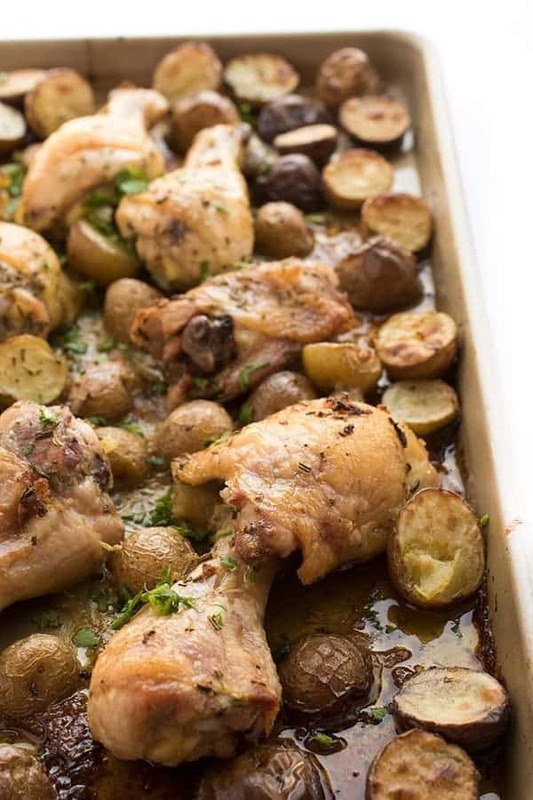 Sheet pan recipes are da bestest and potatoes are always perfect with them. I hate moving because of the hassle but it’s always exciting to have a new space. I’m all about sheet pan meals these days. So easy, so tasty, no fuss, not muss. This recipe will definitely go on the rotation. Best wishes for many years of happiness in your new home! Exactly! I need to make them more often! That is such great news! New places to live can be so exciting – I hope you have a beautiful new kitchen space, too. I know I can’t wait for that! 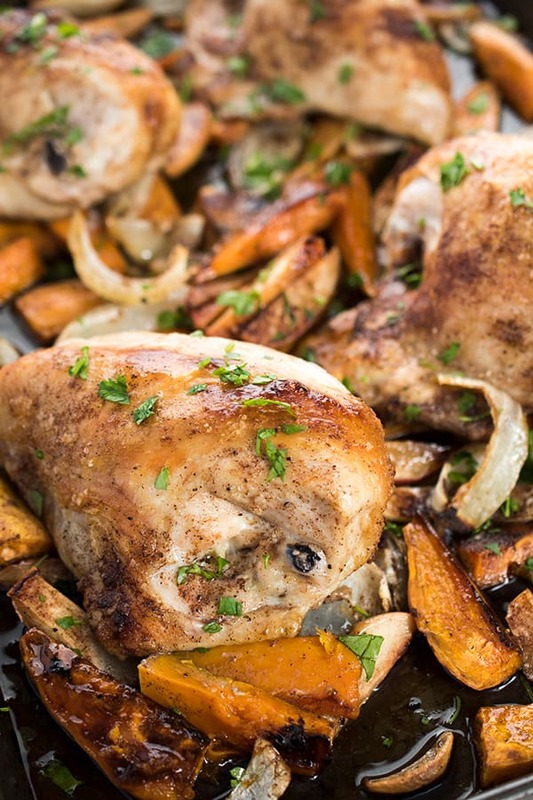 Anyway, you had me at sheet pan… So convenient and delicious, saved for later! Tah! Thank you so much – I’m so excited!